On 23rd May we met Sir Richard Branson. This was celebrating our #VOOM tour win from the end of 2017. It was an eventful day. Last minute notice and a busy calendar meant we had to travel down to London on the same day for a 12:15 meeting, normally plenty of time. However, with a series of transportation calamities out of our control we had to hustle with car, a shuttle, two flights, a dash, a train, a run, a tube, a hunt for a taxi, and a taxi and we only just made it (literally by the skin of our teeth). We past thorugh security, and the ‘meet and greets’ had just started as we ran through the grounds, making sure that after all that eventful travel we ‘got our moment’. When our opportunity came, Richard was pleasantly intrigued with our drinks and business. The health properties got a few positive nods as he took it all in, and admired the packaging/branding. He was very encouraging and supportive of what we were looking to achieve. The conversation soon moved onto the Baobab as he revealed he has an upcoming new book (Always an entrepreneur, always selling!) and in it (Spoiler Alert!!) he states that Baobab is his favourite tree! To his shock, along with drink samples we had 4 Baotic ‘Grow your Own Baobab Bonsai’s’ for his grandchildren. We hope he grows some beauties! He was genuinely shocked with the item. I think among his surprise his exact words were “How Clever”. 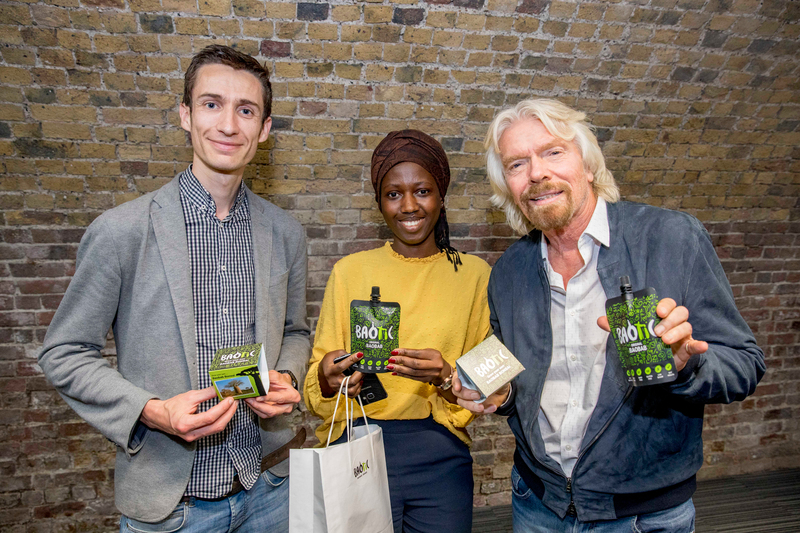 Along with leaving Baotic drinks and bonsai kits and connecting with his team on other Virgin Brands, we thought we would go one step further and throw out an invitation to The Gambia. Something to stay in contact on. 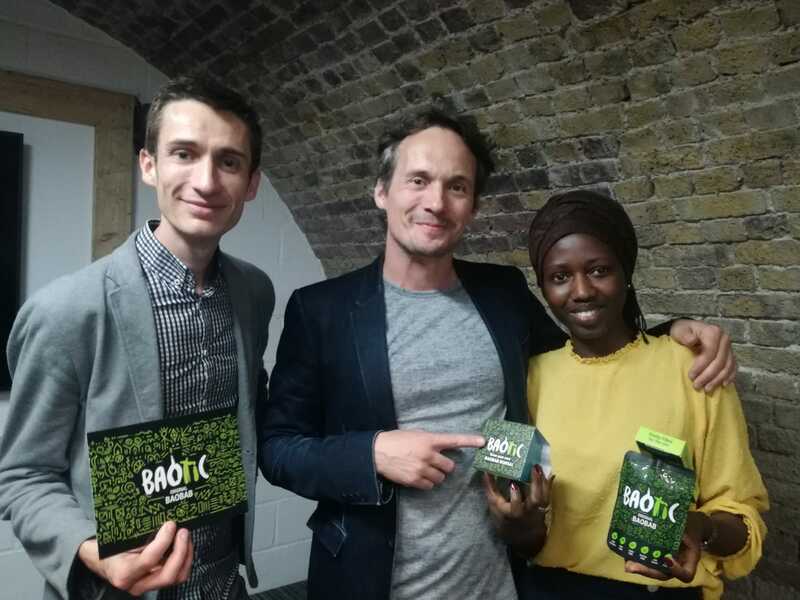 Just as interestingly, we quickly got to some networking and used some familiar virgin staff members to ask if there was ‘anyone else in the room recommended to talk to’ and of course Richard Reed, co-founder of innocent drinks came up. So we got a polite introduction and managed to chat through Baotic drinks, and our progress to date. We were grateful he gave us his time, but he was positive, energised and funky – you can see where Innocent gets its vibe. Encouragingly, he was full of praise for the product. We all had a chuckle as he wracked his brain but couldn’t remember ever coming across Baobab before (although briefly mistook it for a Brazilian nut!). His experience, and passion for business shone through and came across as a genuinely nice guy! “You are clearly making all the important decisions and making them well. The branding is smart, clear and rightly health focused. I see a lot of products every day, and think ‘No’, but I see this and think that you definitely have something” Very encouraging, based on all his rich experience in the industry. 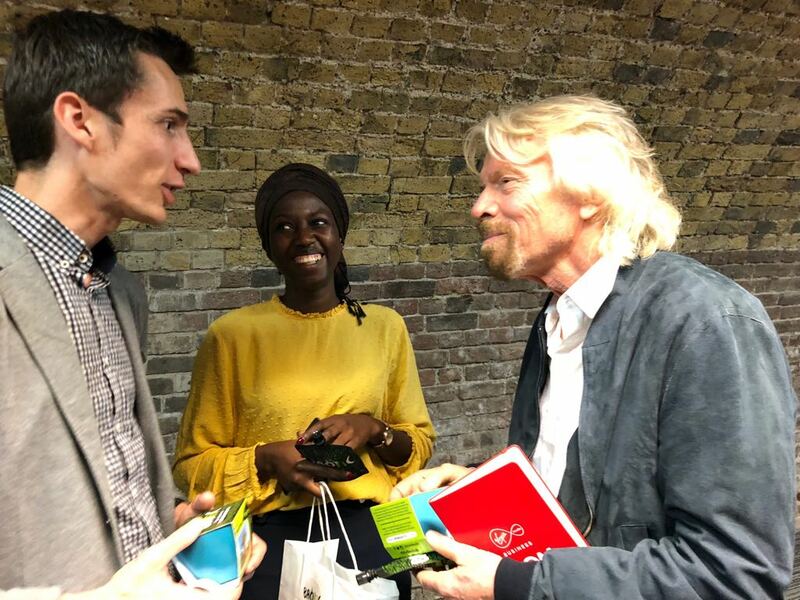 So it had been on the cards for about 6 months, but we can finally say we have met Sir Richard Branson, the godfather of start-ups, and we have the photo (not the t-Shirt) to show for it! You can also read the Scottish Business News Network (SBNN) Media coverage. 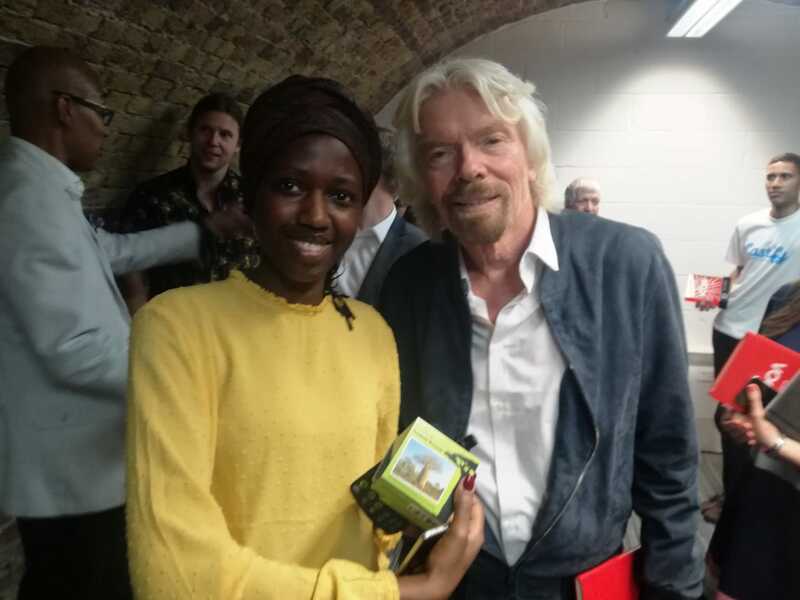 It would have been nice to have more time with Sir Richard to genuinely discuss some of the more deeper, richer conversation on social purpose, development, conservation, and Africa but perhaps (who knows) maybe we can keep the connection and invite him to The Gambia for a specific event or piece of advocacy (2019… watch this space!). Only on the African continent have we ever heard the concept that the world is round and if we separate and keep moving, one day we will surely meet again. That may be abstract, but it’s a beautiful and positive view that always makes us smile. Until the next time Sir Richard!